The high pressure put out by a pressure washer can easily cut through flesh and cause very serious injuries. 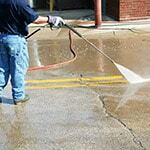 Pressure washers cause high pressure water injection, which is extremely dangerous. These injuries many times result in amputation or severe nerve damage. It's very important to wear protective safety gear and follow safety tips when using one of these very powerful tools. 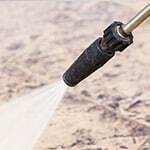 Knowing how to properly use your pressure washer is the first safety precaution to take before using it. 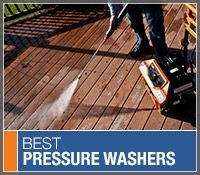 There are various differences among pressure washers; including features, water temperature, and amount of pressure. Read your owner's manual entirely, from front to back. They're not typically that long of a read, but they feature information that may be vital to safe use of your power washer. In addition to safety tips, your user manual will include instructions on how to use model-specific safety features. There will also be instructions regarding how to properly set up and disassemble your pressure washer that may be very important to safety as well. In order to avoid hazards, you have to first be aware of them. Consider all possible hazards before using your pressure washer. This includes obstacles you could trip on, slippery surfaces, uneven surfaces, distractions, pets, children, and even traffic passing by. If you're going to need to stand in the street for any reason while pressure washing, be sure you have a spotter watching for approaching traffic so you don't get hit. Watching for traffic on your own is a distraction from safely operating your pressure washer. If there are others outside with you, have a responsible spotter watch for anyone approaching during use so you don't accidentally direct your pressure washer at them. 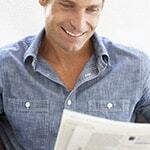 Once you've finished making a list of all possible hazards, plan for how to avoid them. There are way too many images and videos online of people using pressure washers in sandals, wearing shorts, not wearing gloves, and especially not wearing safety goggles. The vast majority of pressure washer injuries could be prevented by simply wearing the proper safety gear. Be sure you always wear closed-toe shoes or boots when pressure washing. We recommend wearing steel-toe boots, as high pressure streams can potentially tear through rubber boots. Hands are one the most common body parts injured with pressure washers. Therefore, gloves are one of the best forms of safety gear you can wear. They not only protect your hands, but improve your grip, helping to avoid other unnecessary injuries. Because you're using highly pressurized water to blast dirt and debris off of surfaces, you want to make sure your legs are protected from flying debris that could break skin. In addition, if you're cleaning sidewalks or pavement, you want to protect your legs from the downward jet of water that's near them. Just as you need to protect your legs from flying debris, it's very important that you protect your eyes from the same hazards. Wear safety glasses, or at least shatter proof sunglasses, to protect your eyes from dirt and other small debris that's being propelled by the pressurized water. If you're using a gas pressure washer, we recommend wearing hearing protection. The motor is not enclosed, so it generates a lot of sound. The loud decibels generated by the motor and pump can cause damage to your hearing if you're not careful. Electric pressure washers are typically much more quiet, and shouldn't require the use of hearing protection. As you should already know, pressure washers are tools - not toys. Never aim a pressure washer at another person or pet. The high pressure water output by a pressure washer can cause very severe injury, and should never be treated like a squirt gun. Always aim carefully for what you're cleaning before pulling the trigger. Do not aim a high pressure turbo nozzle at a window or other breakable materials. 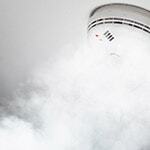 For glass, automobiles, and other more fragile materials, use a low-pressure nozzle to avoid causing damage. Never let children operate a pressure washer, and always make sure to communicate to others not to cross your path while you're cleaning with it. When you're not spraying, engage the safety latch on your gun to prevent unintentional engagement of the pressure washer. 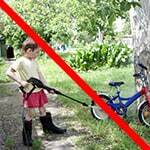 Many pressure washer guns, though not all, feature a safety latch on the handle. This is a small lever that can be flipped horizontally behind the trigger to prevent it from being activated unintentionally. 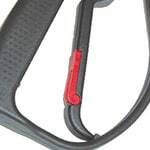 Never place your gun down without engaging this safety latch. And never leave your pressure washer unattended while running. If you have to walk away for more than a minute, turn the pressure washer off. It's not good for your pump to leave it running while not in use, and shutting it off can prevent unwanted accidents. Gas engines emit carbon monoxide, which is a colorless, odorless gas that's deadly when concentrated. Do not use gas powered pressure washers in enclosed areas, ever. Even with windows open, the carbon monoxide will still build up to extremely dangerous levels. If you're pressure washing the inside of a garage, we recommend using an electric pressure washer. It's extremely important to your health and the health of others in your home that you only use gas pressure washers outdoors. When you're finished using your pressure washer, turn it off and squeeze the trigger. Even after your pressure washer has been shut off, the pressure still remains inside, and can cause serious harm if released improperly. Do not detach the hose, the spray gun, or the nozzle until you've squeezed the trigger and released all of the remaining pressure. Removing the gun from the high pressure hose while there's still pressure means that highly pressurized water will be released directly into your hand. Pressure Washing Safety Tips.. Our Power Equipment Direct how-to library can help you learn about Proposition 65 Product Labeling, Sales Tax Information and Product Recalls for Pressure Washer Equipment.